OLD PARKED CARS. 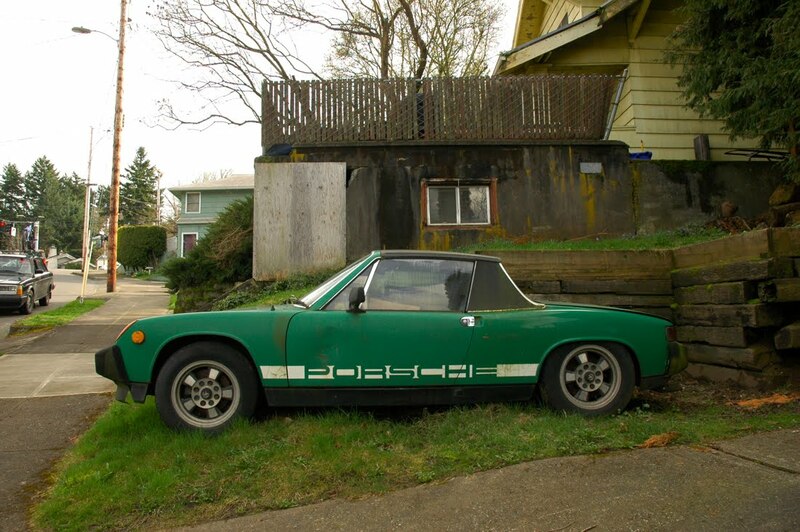 : 1975 Porsche 914. Based on the rubber bumpers, that's not a '74. It's either a '75 or '76. Well this is a 1.8, which started in 1974, and it doesn't have the big rubber fangs hanging off the front, so I thought it was a safe guess. If you've found some photos or more detailed model history, I'd like to see. Bumpers from '70 to '74 were metal, with f/r over riders added to the metal bumpers in'74. The 1.8 was the base engine starting in '74 until the end of production in '76. 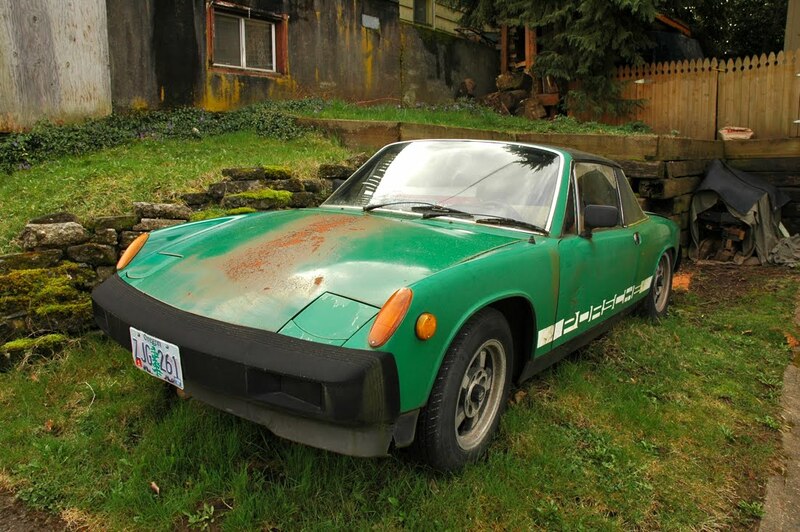 The US market got the large US DOT complaint rubber impact bumpers shown on the green car for '75 and '76. Thanks Tim, you are the man! So are all our 914s http://www.oldparkedcars.com/search/label/914 1975 or 1976 cars? Did they all come with the rubber fangs? Car (1)5-26-2011, Dark Green, is shown as a '75 now. Its either a '75 or '76. There is no external distinction between '75 and '76, so you're guess is as good as mine between those two years. Car (2), 10-31-2010, Yellow, is listed as a '75, but it is actually a '74. Look closely at the bumpers. 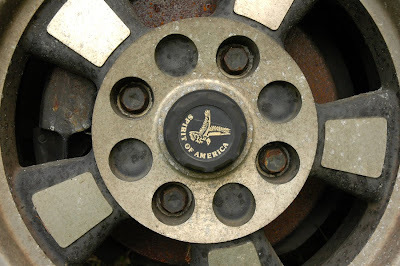 They are narrower, black painted metal with a rubber trim strip on top and the overriders or "fangs" you refer to them. Car (3), 9-9-2010, Dark Green, is listed as a '74, but is actually either a '75 or '76. Again, look at the bumpers. They are the 75/76 one piece, fully rubber, no overiders, and protrude significantly further out from the front and rear of the car than the '74 and earlier metal bumpers. Very helpful Tim, I really did have to look close to see the difference. I had thought the yellow/green one was a 74 (originally titled the post and the photos that way), I'll update all of these. This 75 is by far my favorite, so much character. Are many engine swaps common in these? 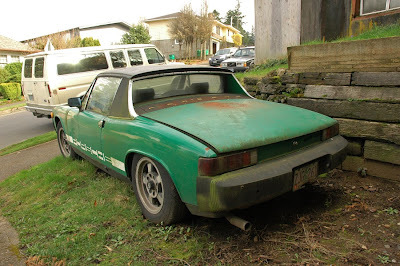 It seems like a similar displacement Japanese transplant would be the easiest way to keep a 914 on the road more affordably. I've seen plenty of cringeworthy V8 swaps, but wasn't sure if there was anything that's more widely accepted. 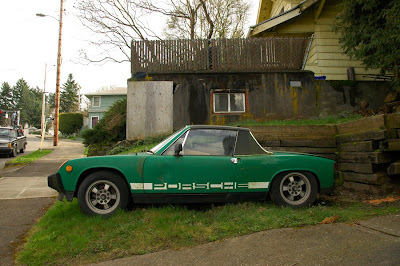 914 was a joint venture between VW and Porsche and 914/4 was equipped with flat four VW engine. Fills modern emission regulations, spare parts are available and more than enough power. Expensive though. The 73 2.0 4 was lighter and just as quick as the far more expensive 70/71 914-6 with the 2.0 from the 911. The 6 encroached on 911 price levels, which is why no one bought them. Hence, the 2.0 4. The Subie conversion can be done, but is pointless. The labor and complexity of adding an H20 cooled engine to a 40 year old mid-engine chassis never designed for it is/was cool the first time, but completely dopey economically. You'll be deep underwater, swimming with the fishes for years to come. The far more effective engine swap, if you want to screw up the lovely handing balance of these cars, is an air cooled 3.6 from a 964/993.